For more than five months, Vicente Fox bet on wearing down the movement in Oaxaca, but without success. Now repression by intimidation has also backfired. A few short weeks before the December 1 inauguration of the PAN (National Action Party) candidate Felipe Calderón, declared “president elect” by the Supreme Electoral Tribunal, and under the international impact of the assassination of U.S. journalist-activist Brad Will, time is running out for the government of Vicente Fox. Despite the earlier declaration by his secretary of the interior (Gobernación), the clerical-reactionary Carlos Abascal, that “in the name of god, we will not carry out any repression,” the government has dispatched thousands of assault troops to Oaxaca. The president who began his six-year term saying he would resolve the conflict in Chiapas (with the Zapatista National Liberation Army, EZLN) “in 15 minutes,” now pretends in his imaginary fairy-tale country, Foxilandia, that his occupation of Oaxaca has reestablished “order, peace and tranquility.” Oaxacans, who shout in fury while mourning the latest of their 17 dead, know well that the supposed “saldo blanco” (zero casualties) reported by the government is a lie. The body of Jorge Alberto Beltrán, a nurse in the Mexican Institute of Social Security, killed by the impact of a gas grenade, is there to prove it. From the moment they entered Oaxaca city at midday on October 29, the troops of the Preventive Federal Police (PFP) – many of whom are from the army’s Third Brigade of Military Police, masquerading as “Federal Support Forces” – have been confronted and surrounded by the working people of the city. Whole families came out to the highway with signs declaring, “Oaxaca no es cuartel, fuera ejército de él” (Oaxaca is not a barracks, Army get out). Housewives confronted police outfitted as robocops with their gas masks, asking them why they repress the people. When a bus full of PFP cops stopped, neighbors punctured the tires, obliging the police to get off the bus, and later forcing them to retreat. When the “Cobra” armored personnel carriers known as tanquetas went into action, shooting out a high-pressure stream of water mixed with a chemical irritant in order to disperse crowds, residents retreated a few paces, but then went back into the street. It is interesting how this weapon, conceived of as a means of marking participants in “riots” with indelible ink for later identification, is rendered useless when used against an entire population in revolt. After a seesaw confrontation lasting for several hours, the troops managed to take control of the city’s central square, the Zócalo. 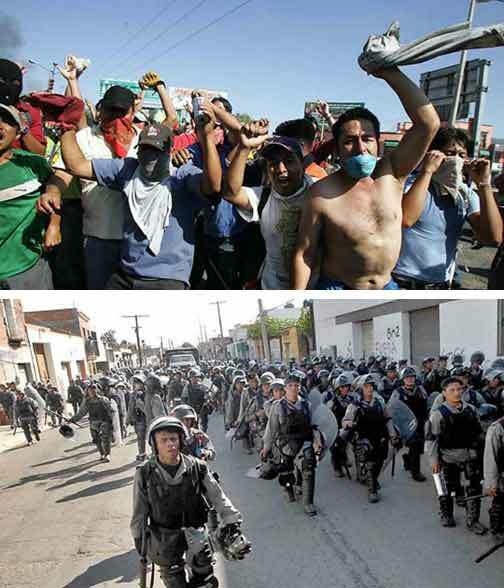 The next day, some 10,000 Oaxacans marched through the streets of their capital occupied by the thugs in gray uniforms, defying the tanquetas mounted with water cannon and refusing to be intimidated by the noise of police riot clubs banging against their shields. Spokesmen for the federal Secretariat of Public Security claimed to have dismantled “more than 50” barricades out of the over 3,000 in the city. So now the encampment of the striking teachers has been replaced by a military camp, surrounded by barbed wire. Referring to the “recovery” of the central plaza by the paramilitary police, a man told W Radio: “They managed to install themselves in the Zócalo. Let’s see how they get out.” Indeed, the supporters of the Popular Assembly of the Peoples of Oaxaca (APPO), after pulling back step by step as the police troops advanced, have raised new barricades around the PFP, which is now trapped in the center of the city. Businessmen in the historical center are complaining that the military looted their shops, after there was not a single robbery during six months of the strikers’ plantón (encampment). The APPO encampment was reestablished in the courtyard in front of the Santo Domingo church. In many ways, the virulence of the rebellion in Oaxaca is due to the fact that the old PRI regime, with its system of corporatist control, while tottering, still rules the state while it has unraveled at the federal level and in much of the country. Now, however, keeping Ruiz in power could become a danger for “national security.” On the night of October 30, as soon as it became clear the Oaxacan population was resisting the police invasion, the Senate unanimously voted (with the support of the PRI caucus) an exhortation to the governor to step down. As usual, “URO” refused and ordered his pistoleros into the street to stage new provocations. 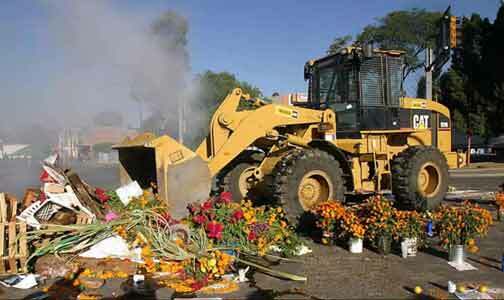 The provocation that set off the battle for Oaxaca University: on the Day of the Dead (November 2), federal police sent a tractor to remove floral offerings to those who died in the struggle. 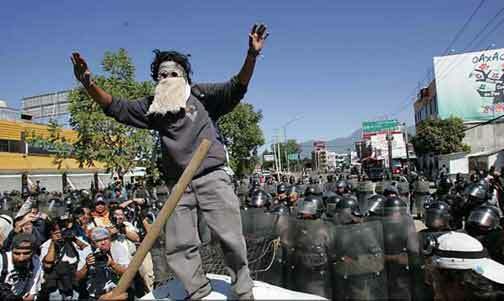 Then came the confrontation of November 2, the Day of the Dead. While in the rest of the country the population went to the cemeteries to remember their deceased relatives, in Oaxaca in the early morning hours the PFP chiefs brought in a tractor to remove the floral offerings honoring the those who had died in the struggle, which had been placed at a barricade near the Autonomous University of Oaxaca “Benito Juárez” (UABJO). The obvious purpose was to “clean out” the last bastion of the APPO and to shut down Radio Universidad, now the only communications media still controlled by the strikers to inform and alert people as to where to go and how to respond to the attacks. Although police commanders promised not to attack the university, they soon lobbed tear gas into the campus and sent troops to chase after youth who threw rocks and launched rockets in response. Several PRI provocateurs and cops in civil clothes were heaving objects at the police; when they were arrested, they yelled “we’re on your side,” and soon after they were released. Dozens of students and local residents, on the other hand, after being captured were sent to a military concentration camp outside the city. When the urgent appeal of the APPO was broadcast calling on people to come to the University under attack, the response of the population was overwhelming. Videos now available on the Internet show women courageously marching up to the police, trying to take away their riot clubs and shields; legions of housewives with buckets of vinegar and Coca-Cola to revive those overcome by the clouds of tear gas; paving stones and rocks being broken up to provide “munitions” to heave at the PFP, either with slingshots or by hand; and cops (when their supplies of gas ran out) throwing rocks back. If up until now the resistance had been peaceful, that has changed. Large quantities of “Molotov cocktails” were thrown, transported to the front in supermarket carts. Some of the tanquetas caught fire, producing several wounded among the uniformed aggressors. Gas tanks and home-made bazookas were also used. One of them almost hit a helicopter, perhaps the one in which General Héctor Suárez Gutiérrez and chief of the PFP high command Ardelio Vargas were overseeing the field of battle. But the fundamental element was the arrival of thousands of defenders who little by little surrounded the troops. Appealing to the police invaders not to repress can been a correct tactic under certain circumstances, and suicidal in others. It is a dangerous illusion to think that the police “are also part of the people,” as even some groups claiming to be socialist have said. At that moment, it was clear that the cops were under orders not to use their arms; tomorrow it could be different. In contrast to the bulk of the army consisting of conscripted soldiers, the PFP and military shock troops like the military police and the Special Operations Group are not simple “sons of the people” or workers and peasants in uniform. The police and special corps are professional repressive forces, sworn enemies of the workers. They are the armed fist of the capitalist state, which rests, in Friedrich Engels’ famous phrase, on special bodies of armed men whose function is to the protect the interests of the ruling class. After several hours of combat (which Mexico City dailies tried to minimize as a “scuffle”), the defenders managed to immobilize one of the Cobra tanquetas, then set it on fire with a rocket, forcing the crew to flee from their flaming vehicle. 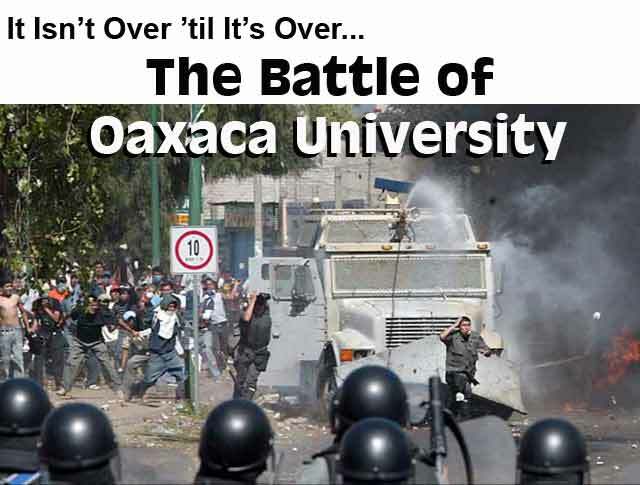 Watching the spectacle with concern, “a retired general of the Mexican Army sent a cellphone text message saying, ‘If they stay on in Oaxaca, the condition of the anti-riot vehicles is such that they are going to require (in fact, they already require) maintenance in order to be ready for December 1” (Milenio, 3 November). Minutes after the incident with the tanqueta, when their tear gas ran out and the police saw that they were surrounded on each of the five streets leading into the crossroads, the order to retreat was given. Not even the bought-off press could hide the failure of the forces of “law and order.” Even as they called the striking teachers and their supporters in the APPO “delinquents,” “subversives” and “pseudo-students” comprising a “mob,” as well as any other insult that came to mind, they had to report in an alarmed tone that the defenders of the APPO had won the battle for the University of Oaxaca against the federal police. “PFP Run Off,” headlined El Gráfico. “APPO Repels the Police in the Universtiy,” declared Milenio. “PFP Forced to Retreat,” reported Reforma in its front-page article. “The screaming didn’t stop. The PFP had stirred up a hornet’s nest. People were coming from all sides. And they were all throwing rocks. From 500 their numbers soon swelled to 1,000, then more and more. They came from various corners, furious. “The group of federales who had held out against the objects thrown at them from in front were hit by two Molotov bombs. On the other side they were jumping with joy. The troops, with military vests, were screaming for help – every minute was an eternity for the men in uniform. “On the other side, they were fierce. Every stone was wrapped in anger. “It was 12:15 p.m. when the first tanquetas went into action. It gave the troops a respite. Their supplies of gas were also replenished…. “But then the noise of rockets began. The alarm was sounded. People were coming down from all the surrounding neighborhoods. The women with buckets full of vinegar and rags. The men with pipes, sticks and rocks. And the best of their arsenal: metal tubes from which they launched rockets at the group of federales…. “The gas canisters shot by the police, from a helicopter and the ground, were thrown back by the furious people. “This provoked a wave of tears, some gasping for air, seeming to find consolation on the shoulders of their comrades after losing their equipment under the hail of rocks. Of course, the Israeli army has responded to the Palestinian intifada (uprising) by unleashing a bloodbath. For their part, the Mexican military commanders, authors of the 1968 massacre, even if they don’t have the colonial mentality of the Zionist occupation army, are no less bloody.